Prepare to boldly go where no man has gone before with the Star Trek: Original Motion Picture Collection, an action-packed box set featuring the six films in their original theatrical versions starring the U.S.S. Enterprise's legendary crew. The films have been digitally remastered and The Wrath of Khan has been fully restored in high definition with brilliant picture quality and 7.1 Dolby TrueHD. $17.300 million on -unknown- screens. When discussions of the relative merits of the first 10 Trek films arises, competition for the top spot almost invariably revolves around II, IV, and VI, with an occasional mention of First Contact. Among those, II - The Wrath of Khan - usually comes home victorious. Debate over the weakest entry also remains quite consistent, with The Motion Picture and Frontier being the strongest combatants, though Generations and Nemesis receive a fair amount of attention. This battle is less conclusive, though I think general public sentiment strikes against Frontier most heartily. Without discussing the pros and cons of that film, I feel that the discussion of the worst Trek film begins and ends with The Motion Picture; all the others are classics in comparison. Every few years I watch ST:TMP because I convince myself that my memory is wrong; the movie couldn't be that bad! However, it is that bad, and I always swear to never watch it again until my memory fades down the line. Despite these and other problems, I still like Frontier and find it to be an enjoyable and provocative film. It focuses on the relationship between the three main characters, a relationship at the heart of the series and one that deserves such attention. Yes, it seems cloying and corny at times, but it nonetheless adds emotion to the film. Beyond this focus, Frontier provides enough good action to make it worthwhile. It's not in a league with the high-octane thrills of Star Trek VI, but it does well on its own. The only real interference with some of these scenes comes from the often-terrible special effects. Frontier uses some computer imagery that looked bad 20 years ago, and the graphics have not improved with age. While I clearly will remain in the minority, I still like Star Trek V. I won't for a second argue that it's the best of the series. I won't even argue that it's in the top 50th percentile. Still, it's a frequently fun movie that offers a variety of compelling segments. 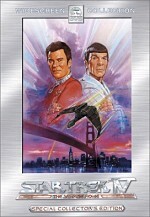 Star Trek V: The Final Frontier appears in an aspect ratio of approximately 2.35:1 on this Blu-ray Disc. Much of the film looked very good, but inconsistencies occurred. Some of my concerns connected to sharpness. Though most of the shots displayed solid delineation, occasionally the film looked a bit blurry or smeared. I wouldn’t call this a major distraction, though, and I thought the majority of the movie seemed accurate. No issues with jagged edges or shimmering occurred, and both source flaws and edge enhancement were absent. Colors seemed tight and rich. The various settings offered a nicely broad palette that the DVD presented accurately and firmly. Even instances of red lighting – which often cause havoc on TV screens – appeared distinct and concise. Black levels were deep and firm, but low-light shots came across as a bit dense. In particular, Sybok tended to get lost during some interiors. Although I liked much of the transfer, the mild issues with softness and shadows made this a “B”. As for the Dolby Digital TrueHD 7.1 soundtrack, it worked quite well and barely showed its age. The front soundstage was especially wide and broad. The mix featured a nicely spaced array of effects and also often - though inconsistently - tossed dialogue into the side channels. The surround track didn't appear to offer any split channel usage but it added a nice dimensionality to the experience. Elements zipped around the spectrum accurately, and the mix seemed nicely active and involving throughout the film. How did the picture and sound quality of this Blu-ray Disc compare with those of the prior SE DVD release? I thought both soundtracks were quite similar. The Blu-ray’s lossless audio might’ve packed a slightly superior punch, but I still thought it was a draw. In terms of the visuals, I preferred the Blu-ray, but not by a huge margin. On the positive side, the Blu-ray cleaned up the various minor source flaws that appeared on the DVD. The Blu-ray also offered stronger sharpness; the greater resolution of the format made some soft shots more obvious, but overall definition was improved. However, I thought the DVD provided better clarity in low-light shots; that was one weakness here I’d not noticed on the DVD. The Blu-ray remains the better presentation but it’s not the best the film could look. In terms of extras, the Blu-ray mixes elements from the prior SE with new components. If a feature comes with an asterisk, that means it’s new and didn’t appear on the SE. If an extra is written in blue, that indicates it’s both a new piece and it’s also exclusive to the Blu-ray Disc. We start with two separate audio commentaries. The first comes from actor/director William Shatner and his daughter Liz, the author of “Captain’s Log: William Shatner’s Personal Account of the Making of Star Trek V: The Final Frontier”. Both sit together for this running, screen-specific track. What a disappointment! Given the controversial issues that surround Frontier, one might expect a lively and heated discussion of the film and its creation. However, one won’t find that. Essentially we learn a few small notes about the movie that mostly emphasize the restrictions under which the director worked. He tells us of multiple time and budget limitations. We also hear of character concerns voiced by the actors, changes made from Shatner’s original plans, and some general anecdotes. Unfortunately, most of these lack much insight, and the pair go silent for much of the movie. Don’t expect to get much information about the making of Frontier or the troubled production in this generally dull and uneventful commentary. For the second track, we hear from *scenic artist Michael Okuda, Trek historian Denise Okuda, Trek writers Judith and Garfield Reeves-Stevens and artist/visual effects supervisor Daren Dochterman. All five sit together for this running, screen-specific chat. They discuss visual effects and technical elements, story and characters, cast and performances, problems that the film encountered, and various other production trivia. This same crew provided a track for ST:TMP that I thought disappointed. Happily, they offer a more engaging discussion here. It helps that Mike Okuda actually worked on Frontier, so he brings a first-person perspective absent from the ST:TMP chat. The participants also seem more willing to discuss the criticisms and controversies connected to Frontier. Both it and ST:TMP have many detractors, but they appeared more defensive during the older film’s track. No, they don’t let the fur fly when they talk about Frontier, but they come across as more willing to get into its flaws. They make sure they offer support to Shatner and those who worked on Frontier as well; they let us know how hamstrung these folks were by budgetary issues and other constraints. The commentary takes us through various aspects of the movie in a generally satisfying manner. The track does sag during its second half, but it’s still pretty good. Heck, I’m just happy to finally learn why Spock refers to them as “marshmelons”! Another running feature arrives with the Library Computer. This “interactive playback mode” allows you to learn about various elements that crop up throughout the movie. It gives us notes about characters, technical pieces, and other connected tidbits. Some of these are tightly ingrained – such as facts about main characters – while others are more tangential. Because of the changing circumstances of the film’s world, some of the same subjects arise multiple times; for instance, new information about Kirk comes up as story elements affect him. From there we shift to Production and its six components. Harve Bennett’s Pitch to Sales Team lasts one minute, 42 seconds and offers a bizarre pep talk of sorts. The producer directs his message toward the sales force who were to promote Frontier, and he uses the Vulcan salute to make his point. Given Frontier’s commercial and critical failure, I figure he never did that again. The disc’s longest program, The Journey runs 28 minutes and 55 seconds as it covers the production of Frontier in general. Shatner, Bennett, Leonard Nimoy, executive producer Winter, screenwriter Loughery, production designer Zimmerman, cinematographer Andrew Lazslo, scenic artist supervisor Okuda, concept artist Eaves, and science advisor Dr. Charles Beichman. They cover the story’s genesis and development, location and effects issues, alterations to the ending, and the film’s reception. This program is a little more frank than usual, especially when Shatner acknowledges his lack of assertiveness as the director. It doesn’t delve into any of the subjects with much depth, though, and it totally refuses to acknowledge the film’s financial failure; Shatner claims that in the end, all the Trek flicks made about the same amount of money, which is way off base. “Journey” has some good moments, but it falls short of becoming a really strong documentary. After this we find nine minutes and 50 seconds of Make-Up Tests. We get shots of “God”, Sybok, General Korrd, Caithlin Dar, and various aliens. Nothing in this silent footage seems terribly fascinating, but it’s a decent piece of history to include here. A similar piece focuses on Pre-Visualization Models. This lasts one minute, 41 seconds and shows crude representations of shots that would involve effects. These low-tech planning tapes are always fun, and this one’s no exception. Speaking of technical issues, Rockman In the Raw offers five minutes and 37 seconds of the ill-fated creature. This area details Rocky from concept drawings through production photos through the sole completed costume. We see more of the rockman footage that also appears in “Journey”. The folks behind Frontier rag on this costume, but honestly, for what the character’s supposed to be, I think it’s fine. The concept of the rockman always seemed ridiculous to me. Shatner still appears cheesed that he didn’t get to shoot the rockman climax, but frankly, I’ll bet the movie would have suffered with that sequence as intended. “Production” ends with the Star Trek V Press Conference. Another piece of archival material from 1988, this 13-minute and 42-second session comes with an introduction from Ralph Winter. Filmed on the last day of principal photography, it includes comments from Harve Bennett, Winter, Shatner, and actors George Takei, Nichelle Nichols, Walter Koenig, James Doohan, DeForest Kelley, and Nimoy. Not surprisingly, this is a fluffy little affair with no real substance. Except for actors, the actors show up just for the publicity; they appear on the set of the Enterprise’s bridge and then promptly split. Shatner fields some softball questions and deflects anything related to the nature of the story. Though lacking in substance, I must admit it’s fun to see this as a historical curiosity. Inside The Star Trek Universe we locate eight elements. We open with a featurette called Herman Zimmerman: A Tribute. This 19-minute and eight-second piece looks at the Trek production designer. We hear from Zimmerman, project coordinator and archivist Penny Juday, producer/co-writer Harve Bennett, concept artist John Eaves, and scenic artist supervisor Michael Okuda. A few decent notes about Zimmerman’s life and work emerge, but the program suffers from a heavily puffy tone. It mostly tells us how wonderful Zimmerman is but doesn’t give us enough examples of why he’s wonderful or how he does his job. An archival piece appears via an Original Interview: William Shatner. Filmed on location at Yosemite immediately prior to the start of the shoot, we get 14 minutes and 36 seconds of Shatner’s thoughts. He mostly discusses the climbing sequence in both practical and metaphorical ways, and he also waxes philosophical about the movie in general. It’s not terribly informative, but it’s interesting to see Shatner seem so enthusiastic – and full of himself - prior to the beginning of filming. Up next we find Cosmic Thoughts, a 13-minute and five-second program that discusses Trek and religious themes. We get comments from Planet Finder Project Scientist Dr. Charles Beichman, astrophysicist/science fiction author David Brin, Pacific Lutheran Theological Seminary President Ted Peters, author Ray Bradbury, Executive Director of the Planetary Society Dr. Louis Friedman, screenwriter David Loughery, executive producer Ralph Winter, Gene Roddenberry’s son Eugene, and Chairman of the SETI Institute Board of Trustees Frank Drake. Mostly it gets into depictions of religions in Trek and various notions connected to those. It’s a reasonably intelligent and introspective discussion. For something lighter, we move to That Klingon Couple. This 13-minute and four-second show includes interviews with actors Todd Bryant and Spice Williams. Filmed together, they chat about how they got their roles, developed their characters, and fit into the Trek universe. It was a great idea to shoot them with each other, as it adds a lot of energy to the featurette. This is a brisk and informative little piece. A Green Future? continues “The Star Trek Universe”. The nine-minute and 24-second featurette gives us remarks from screenwriter Loughery, production designer Zimmerman, UCLA Institute of the Environment Director Richard P. Turco, astrophysicist/author Brin, Yosemite National Park Outreach Specialist David Siegenthaler, producer/co-writer Bennett, and Yosemite Cultural Interpreter Julia Parker. This offers little more than a warning that we need to make sure we don’t ruin the environment. It seems preachy and dull. Next we shift to *Star Trek Honors NASA. It goes for nine minutes, 57 seconds and includes notes from Beichman, Bennett, scenic artist Rick Sternbach, and astronaut Colonel Terry Virts. We see some ways that Trek reflects the work of NASA and current science fact, with an emphasis on some aspects of Frontier. Some of this feels like generic praise for NASA, but there’s enough insight into the science behind the stories to make the show worthwhile. *Hollywood Walk of Fame: James Doohan lasts three minutes, 10 seconds. This shows the ceremony at which Doohan got his star; it includes some remarks from Koenig and Takei. It’s nice to have as a commemoration of the late actor. “Universe” finishes with the three-minute, two-second *Starfleet Academy SciSec Brief 005: Nimbus III. As with prior features in this series, the “Brief” tells us a little about an element of the film. Also like its predecessors, the clip doesn’t do much more than reiterate information found in the final flick. Of great interest to fans will be the collection of Deleted Scenes. We find four of them, and they run a total of four minutes, 17 seconds. These include “Mount Rushmore” (0:18), “Insults” (2:04), “Behold Paradise” (0:52) and “Spock’s Pain” (1:03). Don’t expect any lost gold. One is just dull, and the other three are openly embarrassing. One complaint: the “Klingon Couple” featurette displays a short look at a cut sequence between Klaa and Vixis – why isn’t it here? The Production Gallery offers a four-minute and five-second compilation of photos. These seem above average and include some good snaps. Storyboards covers three different movie scenes. Each segment includes between 54 and 82 frames for a total of 197 storyboards. Though split into three areas, they cover the entire ending sequence set on Shakari. They’re mildly interesting but not revelatory. We discover two trailers and seven TV spots. Lastly, the disc opens with some Previews. 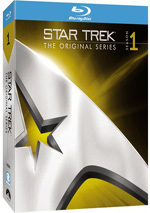 We get ads for the 2009 Star Trek feature film and for Star Trek: The Original Series Season One Blu-ray. Does the Blu-ray lose anything from the SE DVD? Sort of. It drops a text commentary, but the “Library Computer” provides the same kinds of information found there. Nonetheless, I wish the Blu-ray still included the text track, as the “Library” didn’t duplicate all the same material; the prior commentary comes with a more conversational, less dry tone and digs into Trek connections better. It also moves along without the need to constantly press a button, so I think it proves more satisfying. Badly maligned it may be, I still like Star Trek V: The Final Frontier. I’ll gladly acknowledge its many flaws, but I think its foes too quickly dismiss its positives. It remains possibly the most introspective and deepest of the Trek flicks, and that tone makes it interesting. The Blu-ray provides fairly good picture and excellent audio. The extras remain a bit more superficial than I’d like, as they don’t delve much into the film’s problems. Nonetheless, they cover the production reasonably well. The minor problems with the visuals mean that the Blu-ray isn’t a slam-dunk, but it does give us the best rendition of the film to date.